The Scheduler Settings section is where you can configure the Scheduler/Calendar in your Time To Pet account. Click on the link labeled “Scheduler” in the Company Settings section. This is where you can customize a lot of the look, feel and functionality of your Calendar. This includes adjusting the calendar default view, adding warnings and much more. Calendar Default View – You can adjust the default view of the calendar to one of 5 views. Most smaller companies will set this to Week or Month while larger businesses tend to set this to the Day view. You can also choose from two Agenda views. Calendar Interval – The Calendar Interval allows you to adjust how much space is shown on your calendar. Setting the interval to a small value will spread out your calendar and give you more space. Setting the interval to a larger value will make the calendar more concise. Most companies will set to this to 15 or 30 minutes. Time Selector Interval – Adjusting the Time Selector Interval will adjust the time options you can choose from when scheduling events. When set to 30 minutes, you can choose times like 2:00pm, 2:30pm or 3:00pm. When set to 15 minutes, you can choose times like 2:00pm, 2:15pm, 2:30pm or 2:45pm. Most business will set this the same as their Calendar Interval. Scheduling Colors – Time To Pet supports two unique ways to color code your events. Larger businesses tend to set this to “Color By Staff” while smaller businesses tend to set this to “Color By Event Status”. 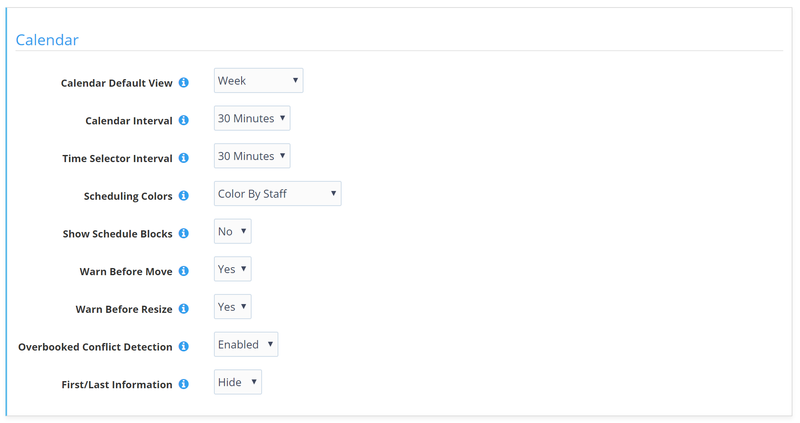 If setting to “Color By Staff”, be sure to give each staff member a unique color. Show Schedule Blocks – It may be helpful to view your Schedule Blocks directly on your Calendar. Showing Schedule Blocks will display the schedule blocks you’ve created so you can easily see the same blocks of times your clients see. Companies that tend to edit and move their events frequently will show schedule blocks. Warn Before Move – Enabling Warn Before Move will warn you when events are dragged and dropped on your calendar. This tool is useful if you tend to move events by mistake. Warn Before Resize – Enabling Warn Before Resize will warn you when events are resized on your calendar by dragging the bottom of the event down. This tool is useful if you tend to resize events by mistake. Overbooked Conflict Detection - When scheduling a staff member who already has a service scheduled for that time, you will be alerted that the staff is overbooked before scheduling the new service. First/Last Information – When set to “Show”, Time To Pet will clearly mark events that are the first and last event on an invoice to staff members.